While Matt and I get most of the face time for the youth ministries, the fact is that there is a whole team of people that are committed to making our young people feel loved and known by their church, including Lane, our middle school coordinator, Brenda our beloved administrator, Jackie and Jenny, our interns, our volunteers, and of course, Erin. Erin Ypya is our youth choir director and youth praise band leader, but more importantly, she’s an integral part of the youth ministries team. She comes to every Sunday night Refuge, she comes on trips, teenagers talk to her about what’s going on in their lives, and she makes the teenagers in her choir and the praise band feel loved and seen. Erin and I started around the same time, and I have loved getting to not just work with her but be her friend. Erin is kind, smart, creative, authentic, funny, and very talented and she leads teenagers out of her whole heart. 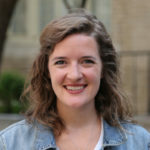 She’s an educator full-time, leading the middle school choirs at Fort Worth Country Day, and it’s a total gift to get to have her on staff with us. From right when Erin first started hanging out with the youth ministry, I remember being grateful for not only for what an asset she was to the team, but for her willingness to be friends with me. I had never been so delighted for a last-minute change of plans. You see, the reason for this unapologetic Erin Ypya Appreciation Post is that this Sunday (8 months later) we are throwing Erin a baby shower! The youth moms and Brenda have done all the heavy lifting on planning, but I am so excited to have this opportunity to celebrate our beloved Erin, her husband Josh, and the imminent arrival of their first baby! Wish Erin all the best on this exciting new chapter of her and Josh’s life, and if you’d like to contribute something, feel free to drop off diapers in the Justin or at the main office this week and will add them to our “diaper cake” (which, everyone assures me, is a tower of diapers shaped like a cake, not a cake made out of diaper). We love you Erin, and can’t wait for your next big adventure to begin!